Trial Balance: The Trial Balance menu command produces, of course, a Trial Balance report as of a particular date. General Ledger: The General Ledger menu command produces a report that simply lists the accounts in your Chart of Accounts list and then changes the account for the month or year or whatever accounting period you specify. Transaction Detail by Account: This menu command produces the report that you would expect: a list of the transactions that affect a particular account. Adjusting Journal Entries: The Adjusting Journal Entries command produces a list of the journal entries that you or someone else marked as being adjusting journal entries. 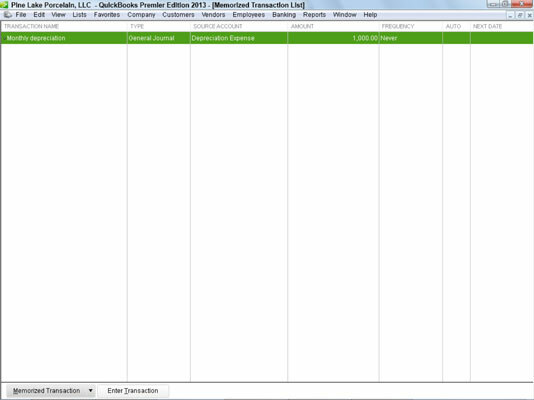 Journal: The Journal menu command produces a report that lists transactions by transaction type and number. Audit Trail: The Audit Trail report is pretty important for accountants — particularly for accountants who are concerned or worried that transactions have changed when they should not have changed. The Audit Trail report lists transactions by the person entering the transactions. The Audit Trail report also lists changes to transactions and identifies who made the changes. Closing Date Exception Report: If you finalize the accounting data for the year (referred to as closing the books) — and you should — the Closing Date Exception report identifies changes to closed transactions. Customer Credit Card Audit Trail: A Customer Credit Card audit trail report that lists only credit card transactions — perfect for people with heavy credit card transaction volumes that they can’t make heads or tails of. Voided/Deleted Transactions Summary: The Voided/Deleted Transactions Summary command produces a summary report of voided transactions and deleted transactions. Voided/Deleted Transactions Detail: The Voided/Deleted Transactions Detail command produces a detailed listing of all voided transactions and all deleted transactions. Transaction List by Date: The Transaction List By Date Report lists transactions in order of date of entry. Account Listing: The Account Listing report lists all the accounts on your Chart of Accounts list. The report also gives the account balance and indicates the line on the tax return where the account is reported. Fixed Asset Listing: The Fixed Asset Listing report lists all the fixed assets on your Fixed Assets list. Income Tax Preparation: The Income Tax Preparation report shows on which lines of which tax forms account balances are reported. Income Tax Summary: The Income Tax Summary report uses your income tax preparation data to show what amounts should be reported on what lines of your tax forms. For example, if you are a sole proprietor filing a Schedule C tax form, QuickBooks looks at all the accounts that you use to track gross receipts or sales. Then it totals the balances in those accounts and shows the actual value that should be reported on the gross receipts or sales line of your Schedule C tax form. Income Tax Detail: The Income Tax Detail report gives the same information as the Income Tax Summary report — except that this report shows the individual accounts that get bunched together to produce the tax line total.